The idea and practice of sacrifice play a profound role in religion, ethics, and politics. In this brief book, philosopher Moshe Halbertal explores the meaning and implications of sacrifice, developing a theory of sacrifice as an offering and examining the relationship between sacrifice, ritual, violence, and love. On Sacrifice also looks at the place of self-sacrifice within ethical life and at the complex role of sacrifice as both a noble and destructive political ideal. In the religious domain, Halbertal argues, sacrifice is an offering, a gift given in the context of a hierarchical relationship. As such it is vulnerable to rejection, a trauma at the root of both ritual and violence. An offering is also an ambiguous gesture torn between a genuine expression of gratitude and love and an instrument of exchange, a tension that haunts the practice of sacrifice. In the moral and political domains, sacrifice is tied to the idea of self-transcendence, in which an individual sacrifices his or her self-interest for the sake of higher values and commitments. While self-sacrifice has great potential moral value, it can also be used to justify the most brutal acts. Halbertal attempts to unravel the relationship between self-sacrifice and violence, arguing that misguided self-sacrifice is far more problematic than exaggerated self-love. In his exploration of the positive and negative dimensions of self-sacrifice, Halbertal also addresses the role of past sacrifice in obligating future generations and in creating a bond for political associations, and considers the function of the modern state as a sacrificial community. 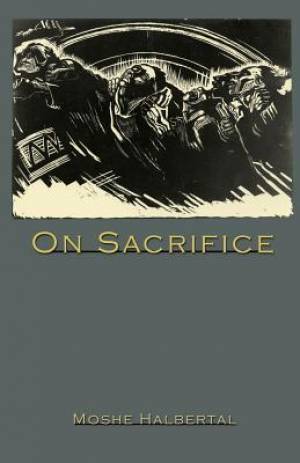 On Sacrifice by Moshe Halbertal was published by Princeton University Press in February 2015. The ISBN for On Sacrifice is 9780691163307. Be the first to review On Sacrifice! Got a question? No problem! Just click here to ask us about On Sacrifice.